Non-Alcoholic Sparkling Red Grape Juice Drink. Non-alcoholic sparkling juice drink. Made with real fruit juice. Gluten free. Free from artificial colours, flavourings and preservatives. Suitable for vegetarians and vegans. Red Grape? 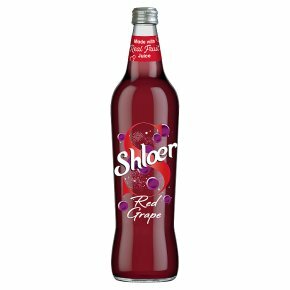 ?A grape day Created from a blend of the finest grape juices, deliciously refreshing Shloer adds a little sparkle to every social occasion. Contents under pressure, open with care in a safe direction away from face.